Even if you’ve never edited video before it’s pretty easy to get a simple surf video up online for everyone to see, it’s something anyone learning surf photography will eventually want to do so I’ll show you how. This is my latest video, I wanted to get it on line quickly so my friends who are down for Christmas who I’ve been surfing with recently can see some of their waves sooner rather than later. Two Spot M Sessions from Ben Pascoe on Vimeo. I’ve been making videos for much longer than I’ve been shooting stills so I feel fairly well qualified to break down the essentials for making a short video clip to complement your still photo’s. You can take this as seriously as you want or have time to, at the moment I’m loving the learning process of shooting stills in the water so the obvious way to capture video for me is to stick a GoPro on top of my housing. To attach the camera I used one of the standard flat sticky mounts, they are supplied with all GoPro HD Hero packages and you can buy them separately if you’ve run out, they are very strong and I trust them to stay put through anything I’d want to go through holding the camera, just make sure you apply it properly to a flat area on the housing. 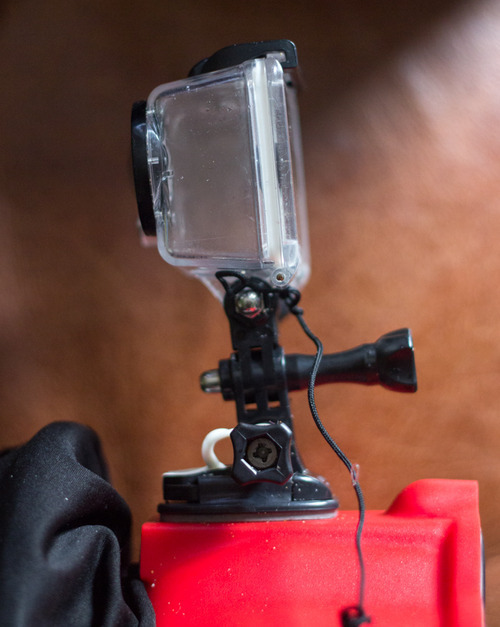 I have used a couple of right angle pieces to extend the GoPro up above my dome port. That’s what I use with my GoPro HD Hero 2, I change them if I’m shooting with a board cam’ or different set-up but that will give you the best results when shooting simultaneously with a DSLR and wide angle lens. Using the One button mode will help prevent fogging in the housing, but it does mean more of a delay from pushing the button to starting recording, the last shot in the video was a surprise wedge that James Sutton turned and caught pretty quickly, this meant I missed the start of the wave with the GoPro as it was still turning on, avoid this by switching it on when you see the set approaching, or by deactivating one button mode, you will have more issues with fogging up when filming long sessions though. A good idea is to shoot a few establishing shots with your DSLR and a nice normal lens (50mm rather than the fisheye/wide angle), get a couple of angles of the set-up, a breaking wave or two and some people. I didn’t have the time to do this so I went for a short and sweet water footage only clip. If shooting video with a DSLR and a GoPro match the frame rates and resolution, this will make it easier to combine the footage in your editing app. All the Canon DSLR’s I’ve used can shoot in 720p at 60fps. Back in the tape days this was a mission in itself, but I’m going to assume you’re shooting to an SD or CF card so once you’ve stuck it in your card reader and used your favourite media organising software to import it (I use Lightroom which files it nicely into a folder by date) you can then import it into your editing app. If I have time I go through the footage once it’s on the hard drive and delete the useless clips, I try to be harsh at this stage, if I don’t what to watch it more than once it gets deleted, anything decent stays and gets a short description added to the end of the file name, for example the file GOPR0012.MP4 is re-named: GOPR0012bpniceclose.MP4 because it features Ben Poole in a nice looking close-out. So time willing you can then import the clips into your editing app with useful names. Double click each file to bring it up in the source panel, set in and out points and drag the clip onto the timeline, repeat if there’s more than one wave in the file. So now you have the raw clips that are worth watching laid out on the timeline, you can get a rough idea of the length of clip you want to produce, unless you’ve got a lot of gold you’ll be wanting to make a short clip, I like to stick to under 2 minutes. Choosing music is very subjective, I try and go for something that fits the feel of the video, this spot is a shorebreak wedge so I wanted something fast with occasional tempo changes to allow for some slow-mo. I actually cut out a fair bit of the original track, it’s a bit repetitive and I’d prefer to leave out footage than have to add too much filler, so I had a 1 minute 30 track to edit to. As you can see from the timeline I put markers on the audio track where the music changes tempo or if there’s a repetitive beat I want to hit when editing, your editing app will then allow you to snap the clip to the marker, if you’re using imovie or windows movie maker you might just have to do this by ear. Then you can arrange your clips to the music, I used the time remapping tool (good tutorial: here) to get smooth transitions into the slow-mo bits, I went down to 25% speed which still looks acceptable as I’d shot in 60fps. That’s the basics done, then you can add titles and credits, I like to keep this simple, it’s a web clip, not a James Bond film, any more than a few seconds of useful information is boring, unless you are gifted at 3D animation and have something interesting to say, just keep it basic and legible and your audience will thank you. I used one easily read font, white on black, with a very simple scale keyframe that took a total of about two minutes to create, duplicate and render. Colour correction or grading of the footage is probably necessary if you’ve shot using ProTune mode with the GoPro, or if your footage is from different sources. This is a simple web clip of surfing, it doesn’t need to be perfect, I use the Fast Color Corrector tool in Premiere, tweak it a bit for each day of shooting then paste it to the relevant clips. Whatever editing app you use should be able to export in a web friendly HD format. I use Vimeo and Youtube, I can watch either of these easily on my phone, tablet and TV (via XBMC), I prefer Vimeo because it feels cooler..
Then you just link to it on Facebook, put it on your blog, tag your friends in the post so their friends see it, don’t forget to put your url on the end and in the description so people know where to look for more information on you and the video. My aim with a web clip like this is primarily to let my friends see the footage and secondarily to make people aware that I’ve shot some photo’s of surfing and point them in the right direction to see them. Hopefully this guide will help others who have similar aims produce something interesting that people will want to watch.